Architectural slabs or paving slabs as they are often called, are becoming the gold standard for high end patios and walkways. You can see them in some of Calgary’s most expensive homes but more and more they are starting to appear in more moderate homes as well. They are beautiful to look at and their grand style will certainly set your home apart from your neighbours. Architectural slabs can be installed in small or large landscape environments and perfectly compliment any well designed garden setting. What differentiates architectural slabs from paving stones is the size of the slab itself as well as the texture or finish of the slab. 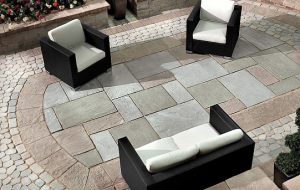 Paving stones or interlocking brick are usually no bigger than 6-12″ across whereas architectural slabs are often 18″, 24″ and even 36″ across and can be found in rectangle or square shapes. They are pre-cast just like paving stones but often have a higher end finish that is typically textured as well. The materials vary with architectural slabs and can include cement, polymer, and concrete materials. Architectural slabs are very solid and are built to last a very, very long time. There are a number of reputable architectural slab manufacturers in Canada and the United States. These manufacturers produce a variety of stylish and timeless slabs for residential applications. Chinook Landscaping and design offers customers a wide scope of slabs to choose from and we can discuss what will best suit your property during our landscaping consultation. The installation process for Architectural slabs is the same as paving stones. After excavating the area is filled with a compacted granular base and then tamped. After that a sand base is put down and graded to create a perfect level area for the slabs to lay. Architectural slabs are more difficult to instal than paving stones as they require more precision to get them perfectly level. Unlike paving stones, they are not finished with polymer sand in between the slabs. The cost of architectural slab is typically around 35 % more than traditional paving stones. The higher cost is due to the more costly slab themselves as well as the higher labour costs due more tedious installation process. You can expect to pay about $ 40.00/square foot installed for architectural slab and the end result is well worth it. When installed correctly architectural slab will definitely add value to your property so you should consider it an investment instead of an expense. Interested in this service? Click here to book your free estimate and consultation.